LPC4350 is the first asymmetrical dual-core digital signal controller with ARM Cortex-M4 and Cortex-M0 processors. The LPC-4350-DB1 development board consists of the most essential components that you need to start your development.It contains the LPC4350FET256 dual-core controller, USB, Ethernet and JTAG connectors, 4 push buttons + 4 LEDs, 16MB external NOR flash. 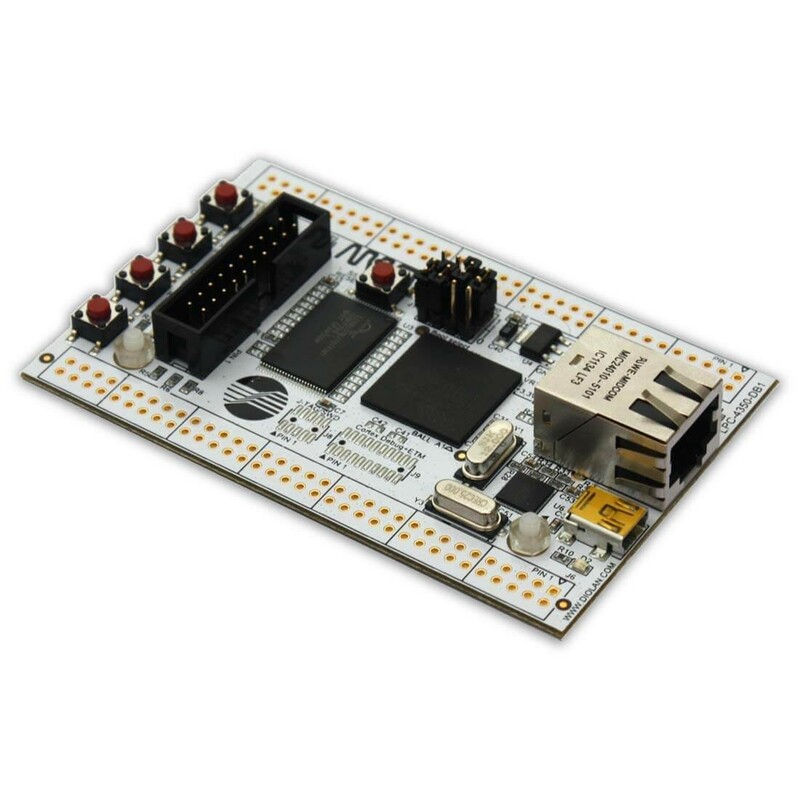 The LPC4350-DB1 evaluation board allows you to quickly prototype the embedded applications. This development board is based on the LPC4350FET256 dual core ARM Cortex-M4 & Cortex-M0 MCU. The LPC4350FET256 microcontroller comes without an internal flash memory. You can use an external 16MBit flash to store your firmware. The external flash is assembled on all LPC4350-DB1 board modifications. If you need a microcontroller with internal flash, take a look at our LPC4357-DB1 evaluation board. The LPC4350-DB1 development board is available in several modifications. Some of the modifications contain external 64 Mbit SDRAM and/or assembled side connectors. There are many optional extension boards, that can be attached to the LPC4350-DB1 side connectors. The LPC4350-DB1 development board contains most of the extensively used components. Its peripheral support can be easily extended by the LPC4350-DB1 PCB soldering options and wide range of extension boards. LPC4350FET256 - dual-core ARM Cortex-M4 DSP controller with Cortex-M0 coprocessor. 10/100MBit Ethernet interface - LPC4350-DB1 evaluation board contains assembled external PHY and connector. The LPC4350 Demoboard has JTAG connector. This connector can be used for debugging process. On the Demoboard J-TAG connector is pointed as the J1. Serial Wire Debug (SWD) provides a debug port for severely pin limited packages, often the case for small package microcontrollers but also complex ASICs where limiting pin-count is critical and can be the controlling factor in device costs. SWD replaces the 5-pin JTAG port with a clock + single bi-directional data pin, providing all the normal JTAG debug and test functionality plus real-time access to system memory without halting the processor or requiring any target resident code. SWD uses an ARM standard bi-directional wire protocol, defined in the ARM Debug Interface v5, to pass data to and from the debugger and the target system in a highly efficient and standard way. As a standard interface for ARM processor-based devices, the software developer can count on a wide choice of interoperable tools. The Cortex Debug+ETM connector interface can access the Embedded Trace Macrocell (ETM) TRACECLK and TRACEDATA signals. The four TRACEDATA signals provide a high-speed data path for capturing instructions.